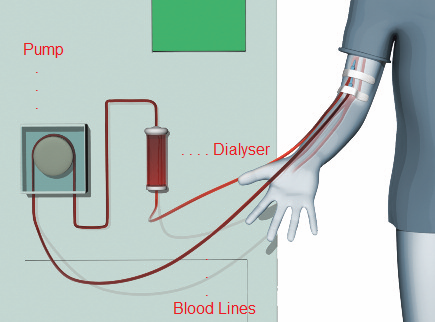 This adapted article, courtesy of Guy’s and St Thomas’ NHS Foundation Trust, presents an introduction to haemodialysis. Yes, you will need a small operation to create a fistula or to insert a dialysis line. A fistula is where an artery is joined to a vein so that the vein enlarges, enabling needles to be inserted into your bloodstream for haemodialysis. It is the best way of connecting you to the haemodialysis machine and is usually made in the arm you do not use for writing. During dialysis two needles are put into your fistula, one to take blood out of your body and the other to put it back. A fistula is usually created under a local anaesthetic. You will need to come into hospital to have this done. You may be able to go home on the same day or you might need to stay in hospital overnight. A fistula is usually done three to six months before you need dialysis because it needs time to enlarge. In some people it is difficult to form a fistula, in which case a small piece of plastic is used to join the artery and vein. This is known as a graft. Please do not let anyone take blood or your blood pressure from your fistula arm. If you need dialysis before your fistula is ready, you will need a dialysis line. This is a small plastic tube put into a large vein in your neck. You will not usually have to stay in hospital overnight to have a line inserted. This is a temporary solution; if possible you should go on to have a fistula or a graft. A few people can only have a line. The tubes on the dialysis machine will be attached to your fistula or dialysis line. These will take blood from your body, which is circulated around the dialysis machine via the pump. The blood then goes through the dialyser where it is cleaned. After that the tubes carry the cleaned blood back into your body. Only a small amount of your blood is out of your body at any one time. It takes about 30 minutes to connect you to the dialysis machine and about 30 minutes to disconnect you at the end. You dialyse for about four hours depending on what your body needs. This will need to be done at least three times a week on alternate days. What machines are used to dialyse me? All of the machines are currently (Summer 2014) Fresenius 5008 machines. This includes all the machines at St George's 2 dialysis wards, Colliers Wood, North Wandsworth and for home haemodialysis (5008s variant - a slim-line version with a remote control and slightly different software). According to the medical team at St George's, these machines give the best haemodialysis treatment currently available. If you choose to have haemodialysis there is some diet and fluid advice to follow to stop too many toxins and excess fluid from building up in your blood. You can find out more about diets here. Where can I receive my haemodialysis treatment? In your own home. 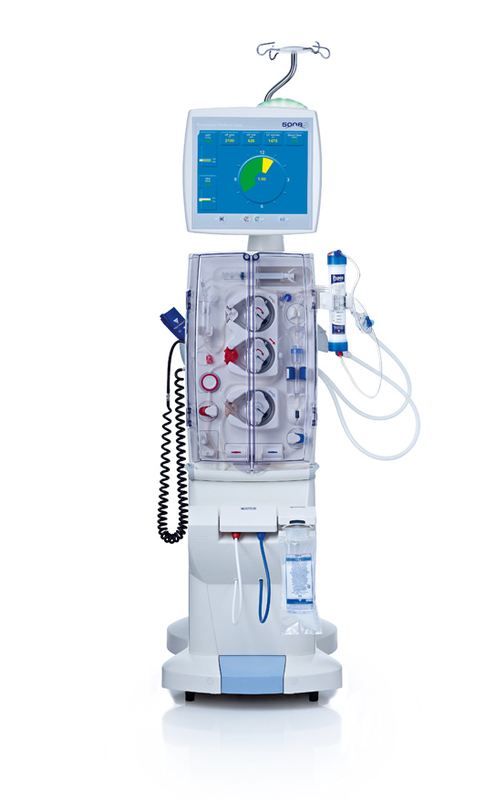 - you can find out more whats involved in home haemodialysis here. In a ‘satellite’ or community haemodialysis unit near your home. Here you will be looked after by a team of experienced nurses but there will not usually be other members of the healthcare team on site. Details of the St George's satellite sites can be found here. In a dialysis unit in a main hospital where you will be cared for by experienced nurses and will also have other members of the healthcare team on site. This option is primarily for those that need treatment within a hospital for medical reasons. Can I go on holiday while on haemodialysis? Yes. As long as your doctor assesses you to be fit enough to travel you can choose to dialyse at a holiday location. For more details see the holidays pages. There might come a time when you feel you want to stop dialysis. You might feel that it is no longer maintaining or improving your quality of life. You are encouraged to discuss this with your doctor, other members of your healthcare team and your loved ones before making a final decision. Your kidney team will want to have a clear understanding of why you made this decision and to find out if they can make any improvements that will affect your decision. If you are thinking about stopping dialysis because of treatment or other medical problems, your doctor might be able to make some changes to improve your situation. If you stop dialysis, you can live for one to two weeks, depending on the amount of kidney function you have left and your overall medical condition. If you feel any discomfort, you can be given medication. Without your dialysis treatment, toxic wastes and fluid will build up in your body reducing your appetite, and making you feel nauseous and tired. The fluid build-up can make it more difficult for you to breathe but your doctor can prescribe medication to help with this. Your kidney team can advise you about the type of care you might need, and help to arrange it, as well as provide emotional support to you and your loved ones. You can find out more information about psychological support here. If you are thinking about stopping dialysis, you may find the information about conservative management helpful.